Figure 7.27 Diagram showing occurrences of most common plant microfossil taxa at the Dogie Creek locality. Gray band = boundary claystone; black bands = coal. Extensions of lines indicating stratigraphic ranges of taxa above their highest occurrence in this section are based on records from other localities. palynomorph taxa were recorded from a suite of 17 samples, of which ten were known to be restricted to the Cretaceous. The stratigraphic relations of the extinction horizon and the boundary claystone indicate clearly that the emplacement of the boundary layer took place just after the extinction event. However, the boundary claystone contains a fern-spore spike of 93% in which a species of Cyathidites is dominant. The uppermost layer of the claystone layer (2-3 mm thick), which yielded iridium and shocked quartz, has a low-diversity assemblage including 63.5% fern spores. A more diverse assemblage in which fern spores are a minor component is present 4-7 cm above the K-T boundary, indicating the return of angiosperm-dominated vegetation. The presence of abundant fern spores within the boundary claystone at the Dogie Creek locality rather than above it was observed and reported by Bohor et al. (1987a), but no special significance was attached to it. Local transport and minor, penecontemporaneous reworking of what was considered to be the impact ejecta that formed the boundary layer were assumed to account for it, especially given the sedimento-logic setting (an environment in which clastic sediment was being deposited, rather than a low-energy mire). Had the impact debris settled into a pond or mire that would later form a coal bed, little or no post-depositional transport would be expected. Such was not the situation at the Dogie Creek locality, however. 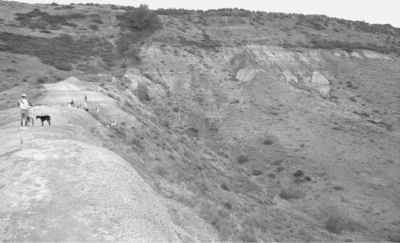 Figure 7.28 Photographs of the K-T boundary interval (a) and the boundary claystone (b) at the Sussex locality. The boundary claystone is overlain by a coal bed and underlain by mudstone. In "b" the thin, dark, uppermost layer contains the maximum iridium concentration and most abundant shocked quartz grains. The color banding of the boundary claystone visible in "b" is a local variation in its lithology not seen in "a." Of the two K-T boundary localities on the west side of the Powder River Basin, one contributed much to the growing body of data on the effects of the K-T boundary event on plants, and the other offered a radical new interpretation that does not withstand close scrutiny. We discuss the more conventional locality first. was measured (26 ppb above a background of 0.012-0.30 ppb), and shocked quartz was found. The palynologic analysis was based on 31 closely spaced samples within an interval of 1.2 m; 74 palynomorph taxa were identified. The Maastrichtian palynoflora includes most of the species known in North Dakota, but there are some differences. For example, Nichols et al. (1992a) identified seven species of Aquilapollenites at the Sussex locality; in contrast, twice that many are present in North Dakota. In all, 16 K taxa (those that do not occur in rocks of Paleocene age in the region) are present at the Sussex locality (Table 7.3), and the magnitude of extinction at the K-T boundary is 34%. 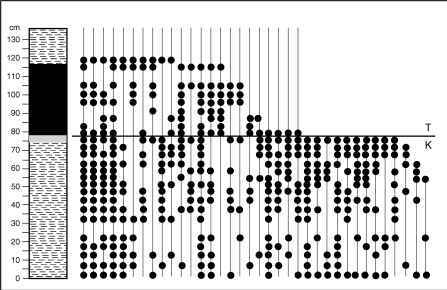 The extinction is abrupt; most of the K taxa are present up to 2 cm below the boundary (Figure 7.29). Microstratigraphic sampling of the boundary layer revealed that a few Maastrichtian specimens are present in the lowermost part of the boundary claystone layer but none in the upper part (Figure 7.28b). This suggests that the exact position of the K-T boundary can be placed within the boundary layer with millimeter precision, but such a conclusion would be over-interpretation of microstratigraphic data. The results are not reproducible from samples of the boundary claystone layer taken a few meters laterally along strike. A fern-spore spike is present at the Sussex locality. The peak of fern-spore abundance (80% of the assemblage) is in a carbonaceous layer 1-2 cm thick between the boundary claystone and the overlying coal bed; 97% of the fern spores are Cyathidites sp. Figure 7.29 Diagram showing occurrences of most common plant microfossil taxa at the Sussex locality. Gray band = boundary claystone; black band = coal. Extensions of lines indicating stratigraphic ranges of taxa above their highest occurrence in this section are based on records from other localities. A high percentage of fern spores is also present in the boundary claystone layer (similar to the Dogie Creek locality), but the maximum spike in abundance is 1-2 cm above. The fern-spore spike effect fades about 10 cm above the boundary claystone, but within that interval spores of two other genera of ferns, Deltoidospora and Laevigatosporites, respectively, are the most abundant palyno-morphs. Evidently the fern-dominated plant communities of the earliest Paleocene coal-forming mire changed rapidly in floristic composition. and the FUI aquatic plant Paranymphaea crassifolia. One of the species of angiosperm pollen was identified as immature pollen of lotus (Nelumbo), presumably associated with the Nelumbites leaves, and a second was interpreted as representing a water lily such as the extant Nuphar. Wolfe proposed a scenario that involved two extraterrestrial impacts within four months of each other, a rain of shocked quartz grains and microtektites, an ''impact winter,'' freezing and thawing of a lily pond, and concomitant plant extinction and survival. Wolfe specifically dated the first impact as occurring in June of the year. 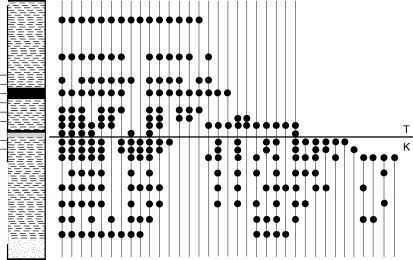 Wolfe (1991) based his dating on the two species of pollen, which he interpreted as representing water lilies that had flowered and produced pollen, and lotus that was killed before producing mature pollen. In living Nuphar and Nelumbo, these events occur successively in the spring of the year. Wolfe (1991) allowed the fact that because the Paleocene ancestors of these plants may not have had exactly the same physiology, his estimate of the timing could be off by a few weeks. The problems with his hypothesis go well beyond those considerations, however. Nichols et al. (1992b) challenged Wolfe's scenario of events at the K-T boundary and undermined the critical element of it, the identifications of the pollen. The species Wolfe identified as pollen like that of extant Nuphar, the early-blooming water lily, is in fact the well-known pollen species Pandaniidites typicus, which has affinity not with water lilies (Nymphaeaceae), but with pandanus or screw pine (Pandancaeae) - see Hotton et al. (1994). Specimens Wolfe identified as tetrads of immature pollen of Paleocene Nelumbo bear no morphologic resemblance to modern pollen of the Nelumbonaceae. 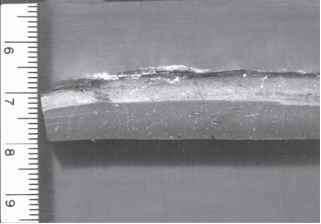 The fossils in Wolfe's samples are Inaperturotetradites scabratus, a species that was normally dispersed as mature, obligate tetrads. Wolfe evidently mistook specimens of I. scabratus for immature, unseparated tetrads. Although less common than P. typicus, I. scabratus has a well-documented record of occurrences in Upper Cretaceous and lower Paleogene rocks in the region. Specimens of these species are shown in Figure 7.30. An isolated K-T boundary locality may be present at North Horn Mountain on the Wasatch Plateau of east-central Utah (locality 64). The potential of this locality for discovery of the K-T boundary is founded on its vertebrate fauna, which includes dinosaur bones, dinosaur eggs and eggshell fragments, dinosaur tracks, and mammals (Gilmore 1946, Difley and Ekdale 1999, Difley and Ekdale 2002). 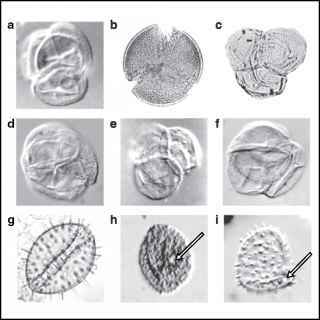 Figure 7.30 Fossil and modern pollen of disputed significance. a - inaperturate tetrad said to be immature lotus (Nelumbo) pollen, from a Teapot Dome sample ofWolfe (1991); b - tricolpate modern pollen of Nelumbo lutea, which bears no resemblance to the Teapot Dome specimens; c - holotype specimen of the inaperturate tetrad fossil pollen species Inaperturotetradites scabratus from the Judith River Formation (Campanian), Montana; d and e - two specimens of I. scabratus from the Lance Formation (Maastrichtian), Wyoming; f - specimen of I. scabratus from the Hell Creek Formation (Maastrichtian), North Dakota; g - monosulcate modern pollen of Nuphar variegatum, which bears no resemblance to specimens alleged to be fossil Nuphar pollen present in the Teapot Dome samples ofWolfe (1991); h - Pandaniidites typicus from the Lance Formation (Maastrichtian), Wyoming; i - P. typicus from the Hell Creek Formation (Maastrichtian), North Dakota. Note that P. typicus, which is the species actually present at Teapot Dome, is monoporate, not monosulcate (arrows point to the pores in "h" and "i"). Mountain is within about 400 m of mudstone with minor amounts of sandstone, algal limestone, and coal. Thin coal beds are present in the middle part of the formation, and thin limestone beds are present in the upper part. Fossils are distributed sporadically through the formation with dinosaur fossils present from the base to about the middle, where they disappear, and Paleocene mammals in the upper part (Difley and Ekdale 2002). Plant fossils include leaves and wood, which have not been studied, and palynomorphs. Difley and Ekdale (1999) reviewed palynological data available from North Horn Mountain citing some unpublished information as well as data from their own investigations. Based on its vertebrate fauna, the lower part of the formation is Maastrichtian in age. However, assemblages from Difley and Ekdale's samples lack species of Aquilapollenites, Tschudypollis, and Wodehouseia, which are characteristic of Maastrichtian rocks in adjacent areas of Colorado and Wyoming. Those results agree with a study by Fouch et al. (1987) on the North Horn Formation where it is well exposed in Price Canyon, Utah. In their investigations of the lithology, mineralogy, and paleontology of the North Horn, Fouch et al. found no typical Maastrichtian pollen species in the lower part of the formation. According to Difley and Ekdale (1999), a carbonaceous interval in the middle part of the formation at North Horn Mountain contains palynomorphs indicative of a freshwater lacustrine environment (Azolla, Pediastrum), but lacks pollen definitive of either Maastrichtian or Paleocene age. The North Horn Mountain locality is worthy of further study because the palynological record is ambiguous. In the northernmost part of the Williston Basin in southern Saskatchewan (Figure 7.31), the uppermost Cretaceous Frenchman Formation is the lithostratigraphic and temporal equivalent of the Hell Creek Formation of Montana and North Dakota, and the overlying lower Paleocene Ravenscrag Formation is the Fort Union Formation equivalent. The base of the lowermost coal bed of the Ravenscrag Formation overlying the dinosaur-bearing Frenchman Formation approximates the position of the K-T boundary. In the valley of the Red Deer River in southern Alberta (Figure 7.31), the K-T boundary lies within the Scollard Formation, which contains coal beds more or less throughout, so the position of the K-T boundary is not so apparent, although dinosaurs such as Tyrannosaurus and Triceratops are found only in the lower part. In Coal Valley in the foothills of western Alberta, the boundary is at the base of the coal zone in the upper part of the Coalspur Formation. 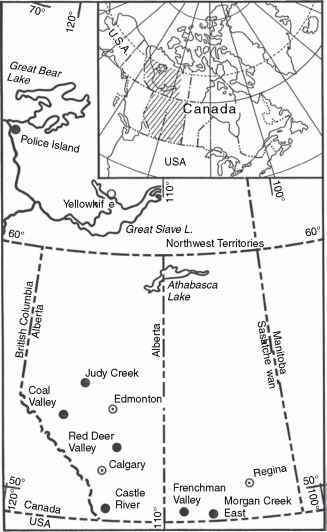 Stratigraphic nomenclature for the K-T boundary interval in Saskatchewan and Alberta is summarized in Figure 7.32. Despite the fairly close geographic proximity of Saskatchewan and Alberta to Montana and North Dakota, there were noteworthy differences in the vegetation of these regions in Maastrichtian and Paleocene time. Forests composed largely of the gymnosperm family Taxodiaceae (or Cupressaceae) were far more prevalent in Saskatchewan and Alberta, and angiosperm species that produced pollen of the genus Aquilapollenites were more numerous. Differences in the plant communities that existed in latest Cretaceous time in Canada and the United States may account for some of the differences in interpretations of K-T boundary events in the two regions (Nichols et al. 1990; Nichols and Sweet 1993). Figure 7.31 Map of western Canada showing approximate positions of K-T boundary localities (from Sweet et al. 1990). From north to south, localities are listed by numbers in Table 2.1 and Appendix as follows: Police Island (84), Judy Creek (67-69), Coal Valley (66), Red Deer Valley (65), Castle River (73), Frenchman Valley (75), Morgan Creek East (77). Reprinted by permission.